The Princess Roza Swarovski necklace features a simple, but elegant design with a large 10mm Swarovski white pearl bead and a sparkling 5mm crystal bead on a twisted sterling silver wire pattern. 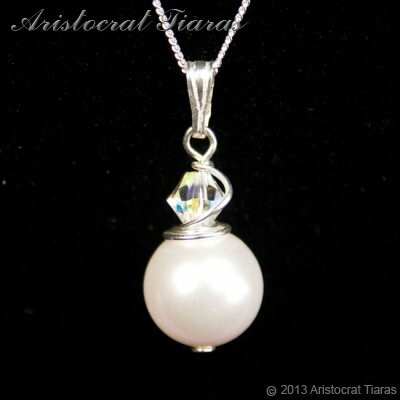 This handmade necklace from Aristocrat Tiaras is part of our bridal jewellery collection for brides designed to compliment our bridal tiaras such as Princess Laura tiara and a perfect companion to the Princess Roza earrings or as a necklace to be worn on any occasion. All our Swarovski jewellery is handmade in Herefordshire UK suitable for weddings, balls, proms, parties and many other functions! Colour and designs may vary slightly from the picture. Ready to ship! This necklace could be with you by 1pm Saturday 20th April (tomorrow).